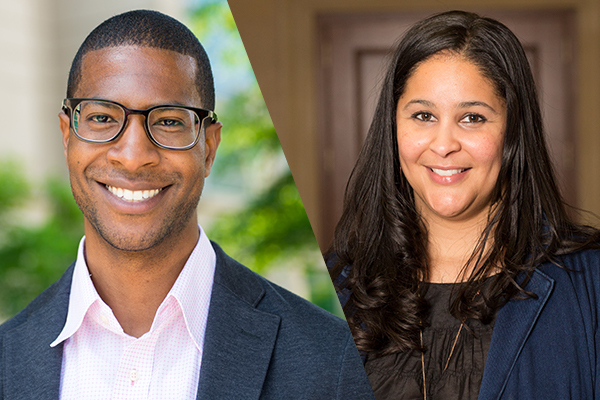 Kourtney Cockrell (MS17) and SESP Professor Mesmin Destin have become allies on a mission to uplift and empower all students. As the director of Student Enrichment Services (SES) at Northwestern, Cockrell regularly interacts with students. Her office assists low-income and first-generation students, offering academic and social support and connecting them with resources and opportunities on campus to help build a sense of community and belonging through programs and workshops. Destin, a social psychologist and associate professor of human development and social policy, explores what motivates students, particularly students of color, low-income students, and those who are the first in their families to attend college. His research suggests that helping students develop an identity and sense of purpose boosts academic achievement, career motivation, and resilience, even in the face of tremendous challenge and adversity. Destin’s research also serves as the foundation for the SES’s Compass Peer Mentor Program, which pairs first-year mentees with upper-level mentors; all participants are first-generation and/or low-income college students. The pairs meet biweekly, and the entire cohort meets once a week on Friday evenings. In fact, those differences in achievement — the tendency for first-generation and low-income students to underperform in school — shrink by a whopping 63 percent, according to Destin’s research with Nicole Stephens, associate professor of management and organizations at the Kellogg School of Management. Compass mentors receive training on how to share their own unique backgrounds, and how those backgrounds have impacted their time at Northwestern. Cockrell also brings in faculty from across campus to share their experiences as low-income or first-generation college students. The Compass program has a growing wait list and several former mentees who have returned as mentors. Meanwhile, Destin says he and Cockrell are “in constant conversation,” working together to refine and improve Compass. “He’s the leader on the research and academic side, and I’m running the implementation piece on the ground with students,” Cockrell said. Destin is also currently studying the impact of Compass, and results thus far are very promising.